On this page we feature Lithuanian festivals and some events that will occur in 2008. We will be updating the page regularly. I enjoy visiting Lithuania during festivals, as it becomes alive with its unique character. Lithuanians love traditions. I learned from Lija that they were the last pagan nation in Europe, therefore some elements from those ancient pagan Lithuanian traditions were preserved. To me, this extraordinary blend of Christian and pagan celebrations makes Lithuanian festivals different and interesting. In 2009 Vilnius will become the European Capital of Culture (I mentioned this on my Vilnius page) and it is expected to attract the largest number of tourists in Lithuania’s history. Numerous events and attractions will be taking place in Vilnius in 2009. Professional musicians and amateurs alike will play anything from classical music, folklore, jazz, rock to African rhythms in the streets and squares of Vilnius. On this day the gates of the castle will remain open after its usual closing time for a magical medieval feast. The courtyard of the castle will be lit with torches and fires, medieval music will be playing and food cooked on open fires. Visitors can watch medieval knight fights and be entertained by medieval dances. Culture night "Let There Be Night! All night long from 6 pm. till 6 am. you can have a unique experience under the stars. Concerts will be held in churches, exhibitions held at museums and galleries. Also you can attend fashion shows, laser shows, poetry readings and other events. June 23 is a special celebration throughout Lithuania. Traditionally, people gather on hilltops or by rivers to celebrate the shortest night of the year. pagan times like dancing and jumping over the remains of the bonfire, girls wearing wreaths and later float them on rivers and lakes to find out if they will get married soon. Celebrations end with searching for the magic fern blossom at midnight, greeting the rising sun and washing your face with morning dews. There are lots of events in Vilnius on that evening, but to get the most traditional feel and customs it’s worth visiting the town of Kernave(Lithuania’s archaeological site), which is some distance away from Vilnius. Concerts, fairs, outdoor cafes, various competitions, cruises on medieval boats on the lake and other events will be held in Trakai. In the castle’s courtyard there will be fights of knights, medieval craftsmen and musicians, ancient cuisine and other medieval entertainment. It is an annual public holiday. Some activities are held throughout the city to commemorate the coronation of the only king of Lithuania Mindaugas in 1253. 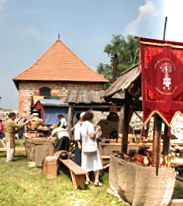 Trakai Island Castle will hold a traditional event – three days of ancient crafts. The craftsmen, based in the courtyard of the castle will demonstrate their skills and reveal the secrets of the ancient technologies. Medieval music, fighting knights and delicious food, cooked according to rare medieval recipes will await you. The main and most spectacular fiesta of the city offers a wide range of high - quality, free entertainment from classical music and opera, to jazz, folk, pop, rock and world music, and also street theatre, fashion shows and carnivals in the streets of Vilnius Old Town. The colourful and attractive fire sculpture festival takes place in Vilnius every year to mark the Autumnal Equinox, the time when the day and night are of equal length. Since ancient times the ceremonies were held on that day in memory of the ancestors souls. You will be enchanted by the magic of fire, pyrotechnics and of course the ingenious creations of the sculptors. (Last year it was held at the foot of Gediminas Hill). Most Vilnius residents visit cemeteries and light candles on the graves of their loved ones. The world of lights, science, nature and art will unite during the LUX Festival of lights to illuminate the city and reveal the mysterious world of light. Seventeen light projects (installations, plays, mysteries, operas and visual projections) lit the city in November of 2007. 31 of December of 2008 will be very special for Lithuania. It will mark the beginning of the 2009, the upcoming most cultural year in the city‘s history. An extraordinary festival of various events and attractions will take place in Vilnius squares and streets. A grand concert and entertaining programme will be held and also you will see an impressive display of lasers and fireworks.